ADDA in South Asian languages (pronounced "Uhd'da") means a community gathering having a friendly or intellectual discussion. It takes a village to raise a child. - African Proverb. In our Urban Cities, Apartment Communities are those Villages. A piece of land on which tens or hundreds of families live a harmonious life. A child always has a playmate here, every festival is celebrated by all, challenges of daily life are faced together as neighbors with a strong glue of shared common wealth - the value of their property, their life's savings, the place which is at the centre of their workplace, school, and favorite hangouts. The Apartment Community is also a registered organisation - collecting common funds towards paying vendors for maintenance or building new infrastructure, paying Taxes, handling disputes internal as well as external. The biggest difference in this organisation being its leaders. These are the Owners elected to be in the Managing Committee. They spend scarce personal time in placing operational processes, evaluating expense decisions, executing projects for common welfare without looking for selfish gains. Some of them learn altogether new skill e.g., accounting to do this! While they receive loud applauses, they also receive louder doubts that often make their job look thankless. We believe in their courage, and their drive to build that dream neighborhood! It is for these Apartment Residents and their Managing Committees that we in Team ADDA dedicate our life's work. We build the best Software Product for them on which they can run their Apartment Community - elegantly weaving together every aspect of Communication, Facility Management, Security, Accounting. Started in 2009, we’ve been relentlessly working towards bringing residential communities together by connecting them online. 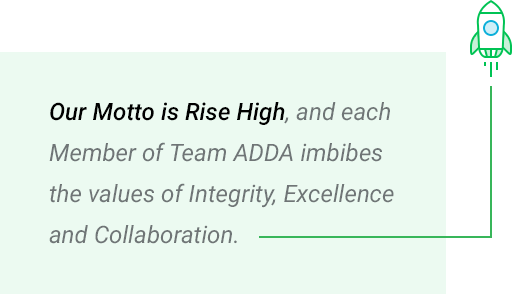 Our Motto is Rise High, and each Member of Team ADDA imbibes the values of Integrity, Excellence and Collaboration. ADDA provides every tool needed for smooth and efficient running of any Residential Community. On one hand there is the ADDA App, a private social network for residents. On the other hand is a convenient facility management, billing and accounting, security management platform for property managers, managing body/committee. ADDA ERP & GateKeeper are used by 18,500+ Residential Complexes Globally. Copyright © 2017 - 2019 ADDA.io All rights reserved.